Basketball season is in full swing as we countdown to the championships! I am sure there will be lots of parties for The Big Tournament. I completely understand that throwing a party, especially a sports themed one, can be daunting. However, think of it this way- cakes, cookies, pizza, OREOs and many classic party dishes are all round. Guess what else is round? A basketball! So this theme is actually a cinch to do. A few snacks and some festive themed crafts really help everyone to get into the spirit! Everyone loves a cute table and a setup is easy to do with a few items you may already have on hand. I always like to add at least one decorative area with some height. This can be a cupcake stand or even some stacked crates. I love a stack-able cake stand with a lip like this one. 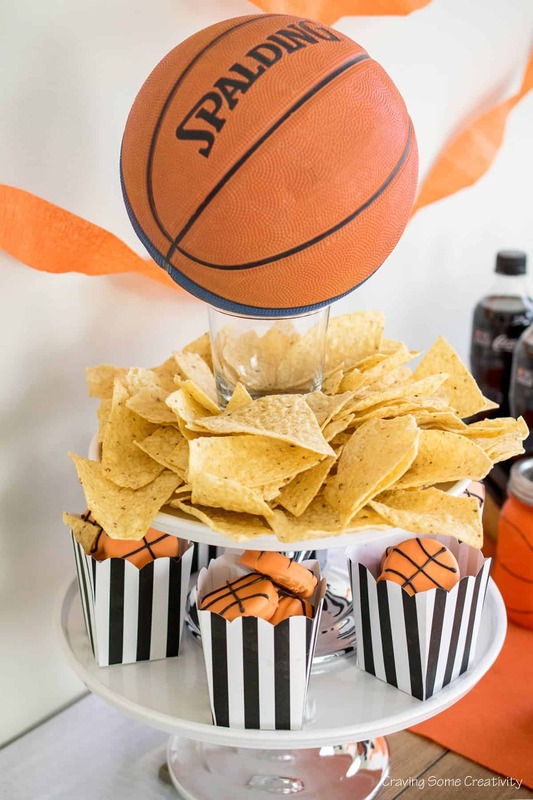 For this basketball party, I used a cupcake stand and balanced a basketball on a glass to add height. The table is layered with a coordinating piece of felt cut to size and some wood-look floor tiles. While you may not have scrap tile laying around the house, another festive tea towel or even painted scrap wood would look beautiful. All of these basketball party goodies have to come from somewhere, right? For this party, I kept with my ’round’ theme by purchasing some OREOs, pizza, queso dip and chips, and drinks. 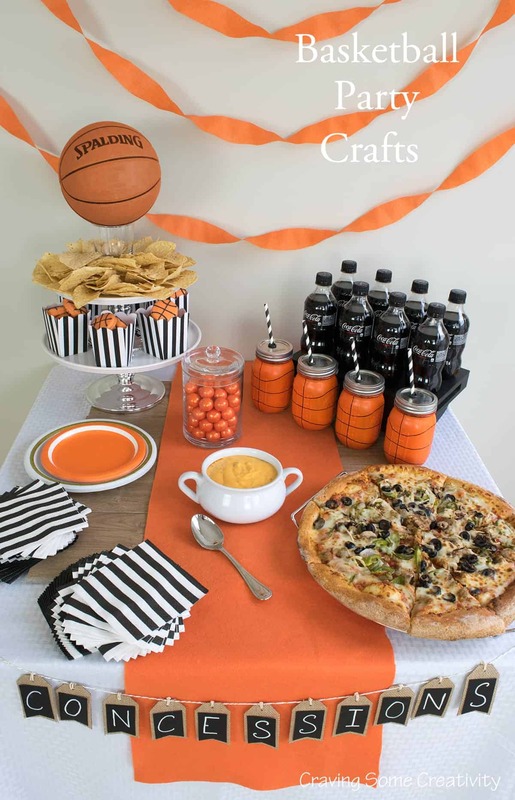 Although I kept my basketball party classic with orange and black, you could use your favorite college team’s colors. Another idea that easily coordinates is using the colors of two rivals if they are playing each other. That would be really fun! One thing I love about parties is creating crafts and decorating for the party. We threw around quite a few ideas about what to serve and I wanted to do something special with the drinks. Usually, I put cold sodas in a giant ice bucket and just go with it. However, the ice melts so fast and the bucket gets so heavy that I can’t lift it on my own. That was how I decided to serve individual mason jars with ice. Of course, I gave them the full basketball party theme treatment! For these jars, use paint specifically made to bond to glass – the symbol on the top of this one indicates that it is for glass. You can find it at almost any craft store in the craft paint section. Paint several coats or until desired opaqueness is achieved with about 30 min to 1 hour between coats. Since they will be used for drinking, you do not want to paint the rims around the lid area or any area that will come in direct contact with food. 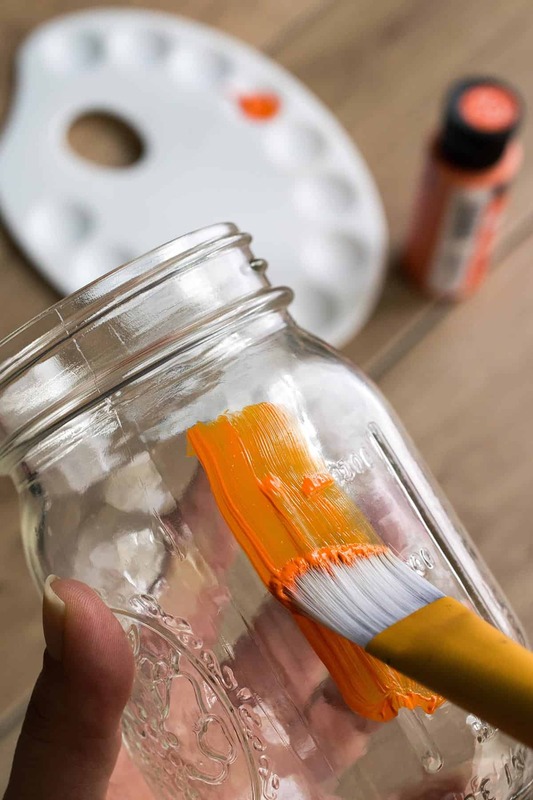 To make the paint more resistant to scratching, you can either allow the paint to air dry for 3 weeks or bake them. If you are baking glassware, place the completed, painted glass in a cool oven. Turn the oven to 350ºF and bake for 30 minutes. Turn the oven off and allow to completely cool in the oven. You definitely don’t want to jostle or allow the glass to change temperature too quickly, which results in possibly breaking. After completely cool, set aside for a day or two. Easy and SO cute… and of course, you can’t beat OREOs for when that desire for something sweet hits. These simple decorated OREOs are pretty awesome, you guys… so let’s talk about that for a sec. 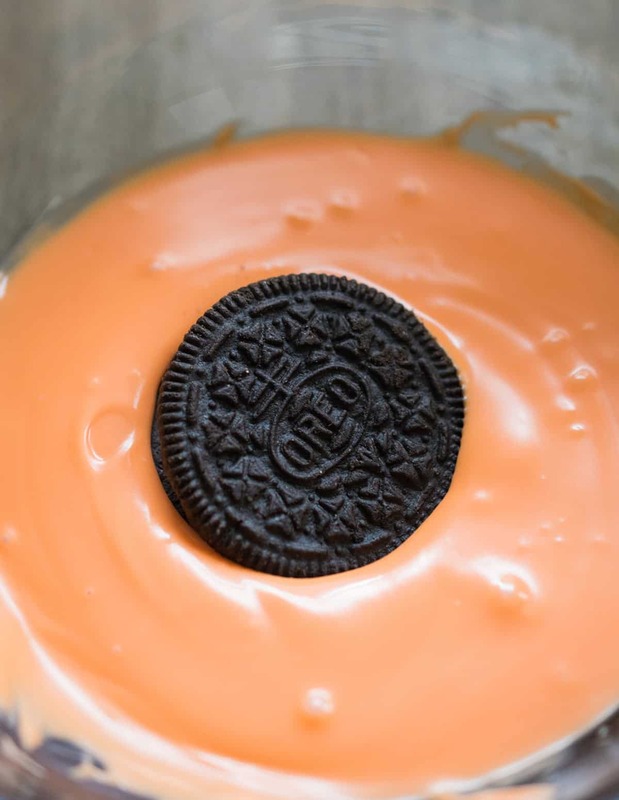 I dipped the OREOs in orange candy melts, covering both sides. I scooped them up with a fork and shook off any excess chocolate. Allow the candy coating to cool on wax paper or my favorite silicone baking mat. 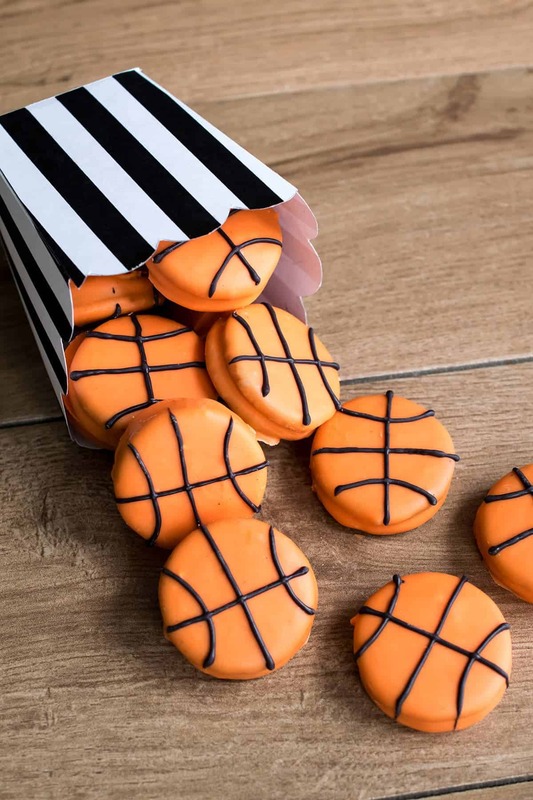 Using a #1 Cake Decorating tip (very, very tiny round hole) and black candy melts, write the stripes on the basketballs. Want More Party Ideas? 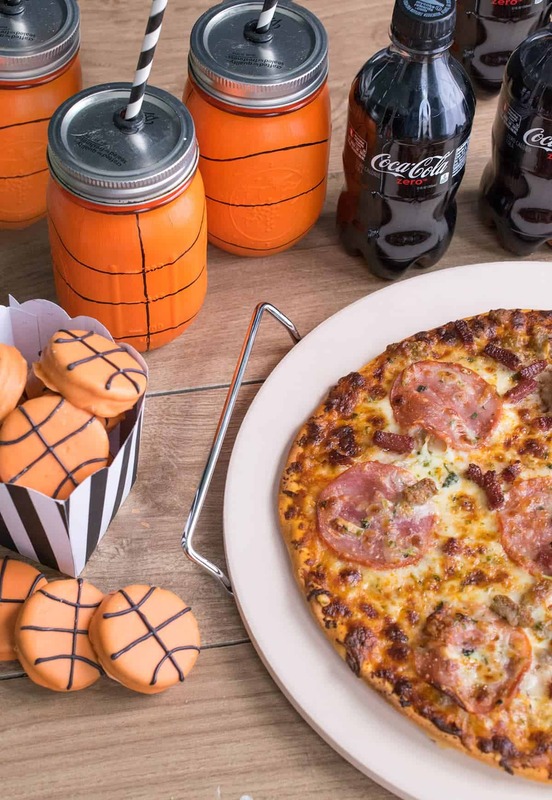 Check out these Sports Themed Parties and more! Now, who wants to party?! I love these! How fun and simple! 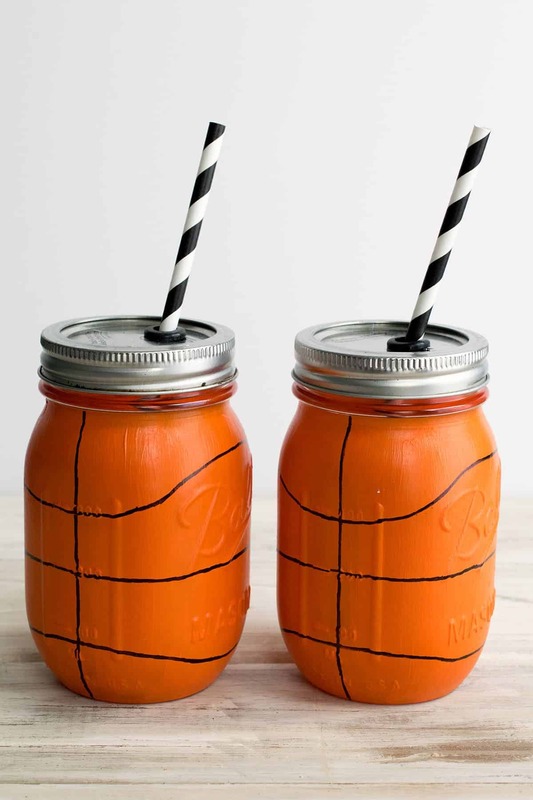 What great ideas for a basketball party! I LOVE the covered Oreos, and those painted mason jars are fantastic. Thank you so much, Christina! The kids loved them. 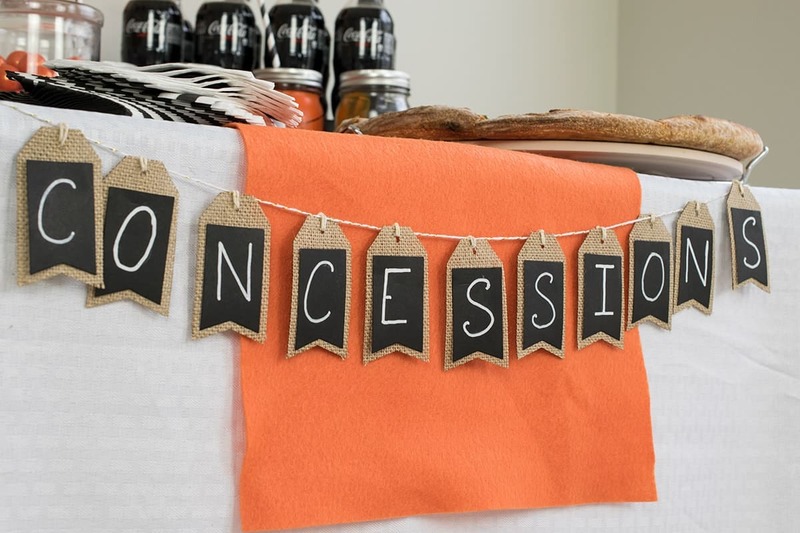 These are such adorable ideas for a party! The Oreos look sooooo cute! I love that you included pics that are step-by-step for the Oreos and the Mason jars! I LOVE the mason jars! They turned out so well (I actually thought you had purchased orange jars!) and chocolate covered Oreos??? YUM! The mason jars are adorable and the cookies look delicious!! Great job! I love any craft involving mason jars! Soo cute, and I want to eat those cookies!!! This is so cool, Rachel! My husband loves basketball and these projects will add up to our excitement. Thanks for sharing your creativity.